SAR is an active instrument that transmits/receives electromagnetic radiation. It operates at microwave (or radar) frequencies. Wavelengths are in the range of 2-30 cm corresponding to frequencies in the range of 15-1 GHz. It works in the presence of clouds, day and night. Synthetic aperture principle is to generate a very long antenna through the motion of the platform. For ASAR the length of the synthetic antenna is approximately 20 km. This leads to very high resolution. The surface roughness is the source for the backscatter of the SAR signal. 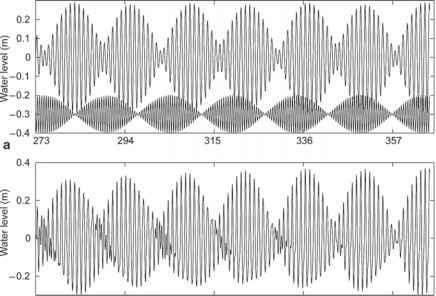 The signal that arrives at the antenna is registered both in amplitude and phase. Although the SAR sees only the Bragg waves (XB=X/2 sin 6, where 6 is the incidence angle, X the radar wavelength and XB the resonant Bragg wavelength) these waves are modulated by a large number of upper ocean and atmospheric boundary layer phenomena. This is the reason why SAR images express wave field, wind field, currents, fronts, internal waves and oil spill. They also provide high resolution images of sea ice (see next section).